Other common names: Coughwort, assfoot, horsefoot, foalfoot, bull'sfoot, horsehoof, colt-herb, clayweed, cleats, dove-dock, dummyweed, ginger, gingerroot, hoofs, sowfoot, British tobacco, gowan. Habitat and range: Coltsfoot has been naturalized in this country from Europe, and is found along brooks and in wet places and moist clayey soil along roadsides from Nova Scotia and New Brunswick to Massachusetts, New York, and Minnesota. Description: In spring the white-woolly, scaly flowering stalks with their yellow blossoms are the first to appear, the leaves not being produced until the seed has formed or at least toward the latter part of the flowering stage. The flowering stalks are several, arising from the root, and are from 3 to 18 inches in height, each one bearing at the top a single, large yellow head, reminding one of a dandelion, having in the center what are called disk flowers, which are tubular, and surrounded by what are known as ray flowers, which are strap shaped. When the seed is ripe the head looks somewhat like a dandelion "blow." The flowering heads are erect, after flowering nodding, and again erect in fruit. The bright-yellow flowers only open in sunshiny weather. They have a honeylike odor. The leaves, as already stated, appear when the flowers are almost through blossoming, or even afterwards. They are large, 3 to 7 inches wide, almost round or heart shaped in outline, or, according to some of the names applied to it, shaped like a horse's hoof; the margins are slightly lobed and sharply toothed. The upper surface is smooth and green, while the lower is white with densely matted woolly hairs. All the leaves arise from the root and are borne on long, erect stalks. 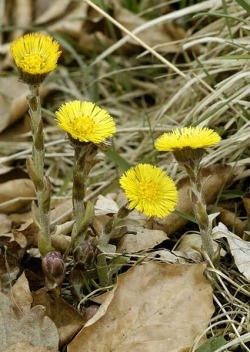 Collection, prices, and uses: All parts of coltsfoot are active, but the leaves are mostly employed; they should be collected in June or July, or about the time when they are nearly full size. When dry, they break very readily. Collectors are paid about 31/2 cents a pound. Coltsfoot leaves form a popular remedy in coughs and other affections of the chest and throat, having a soothing effect on irritated mucous membranes. The flowers are also used; likewise the root.